Have you ever been riding on the highway when suddenly you see a car that you’ll never forget? 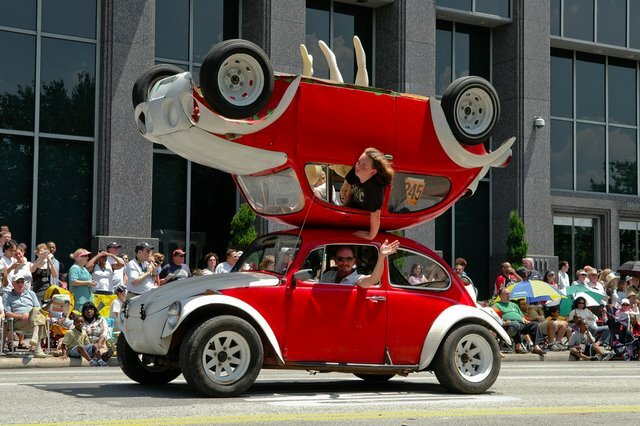 I am sure that we’ve all seen some crazy cars before but maybe not this crazy. Some classic crazy cars include Barbie cars, cars that look like animals and of course you’ll find some crazy redneck cars out there. If you think that you’ve seen some crazy cars in your lifetime then check out these 10 crazy cars that will make you look twice on the road. I must admit I love hotdogs. There are times when having a hotdog just really hits the spot. I also love having hot dogs on the fourth of July. 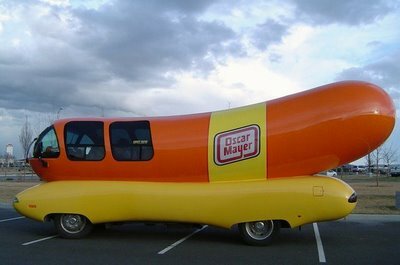 While I admit that I love hotdogs, I am just not so sure that I would ride in something like this. I must say that it’s very clever and I do like how they made the bottom of it look like a bun. I might have my picture done next to it but I just could never see me riding in something like this personally. How about you? Here’s a car for the ladies. It’s a Stilleto car! 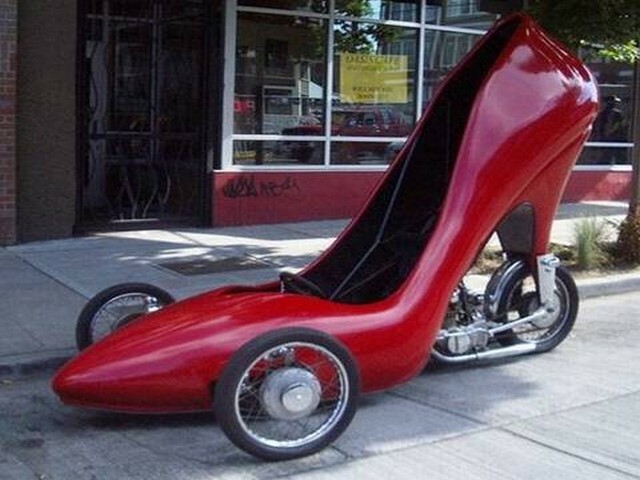 As much as I love high heels I am not so sure I would ever own a car like this one. It of course has to be red or either black but yes, red makes it better. Don’t you think? I guess my only complaint about the stilleto car would be is that there’s only enough room for one and not for two. What if she wants to go out on a date? She’ll have to revert back to her boring car instead of using her awesome Stilleto car and her date might be very disappointed. I did a crazy car that was reserved just for the ladies but what about the guys? Here you go guys! I give you the pac-man car. If you’re into pac-man or a retro junkie then you might really want to get your hands on this car and take it for a ride. Cool down men. I said “hands on the car”. 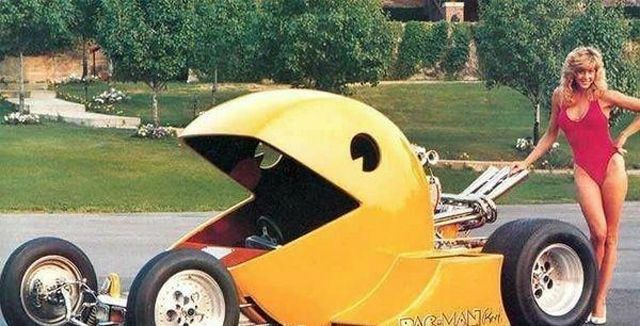 Even if you’re not into pacman, after seeing her I am sure that you might just want to get into the car anyway for a spin but not on your own, right? 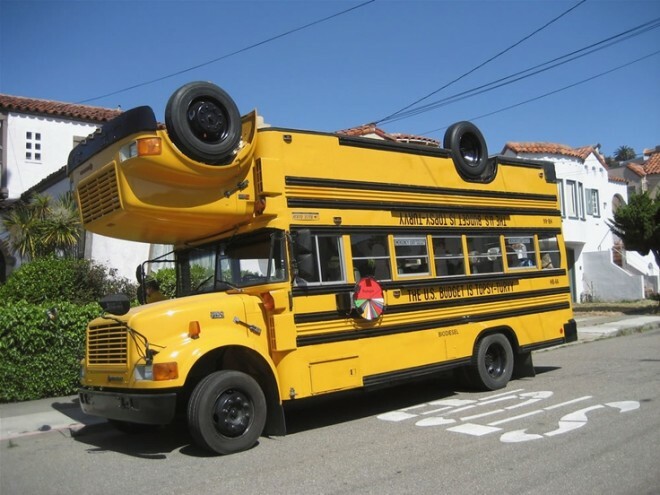 Kids, how would you feel going to school on this type of bus? Would you do it? I think that this type of school bus belongs in a Harry Potter movie or either some sort of scary movie. What about you? One thing is for sure. I don’t know how safe I might feel getting on this type of bus. Maybe the reason why I wouldn’t feel safe is just because of how it looks upside down. I don’t know what the owner of this car was thinking. 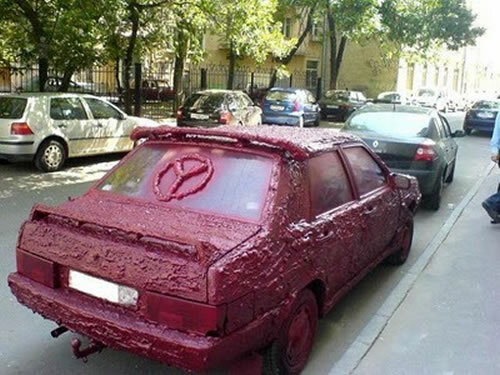 Maybe he thought if he painted it red and put a peace sign upside down on it that it would make the car look better. I am not sure but to me I think that maybe he should have left the car the way it was originally. I am sure that the way it looked originally has to be better then what it looks now. My next question is, was he standing on the roof when he put on the peace sign? In so many ways it almost looks like a toy car. In December this car might blend in with your home but it won’t blend in on the road. My question is, do they leave the lights on it year round or is it just for December? It’s as if the lights were made for the fish on the side and it almost looks as if they are trying to be a big tank for the fish, so I am guessing that they do leave the lights on year round. This vehicle makes me want to sing some Christmas songs. 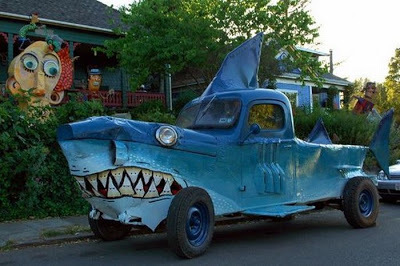 The shark car looks like he’s got an attitude and he just looks mean! If I ever saw this type of car pulling up next to me on the road, I will admit that I would be nervous. It’s not a car that I would want to accidentally hit. If the car looks this mean what are the owners like? I would rather have a cute dolphin car instead of a mean looking shark car. 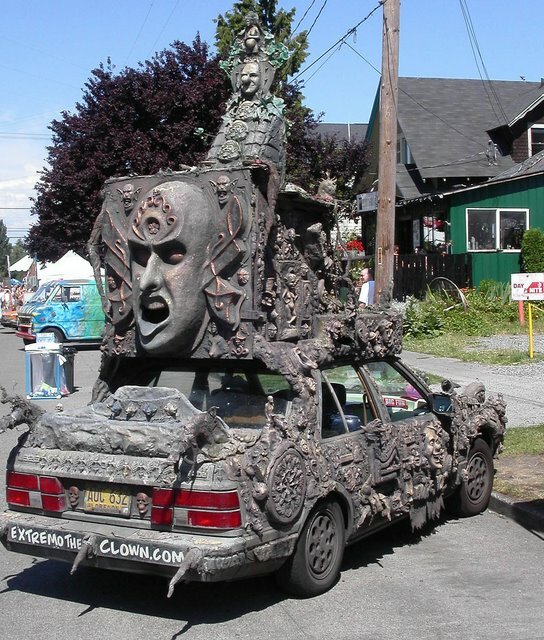 This car might even be scary enough to give me or someone else nightmares. What do you think? 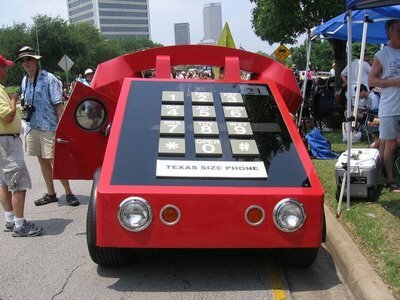 Here is another car that you don’t want to accidentally hit on the road. Clowns are just scary in general and so seeing this on the road would give me the creeps. However, I do think that this car might be a good one for the clown to drive in the American Freak Show horror stories on FX. I can almost picture him wanting this type of vehicle. Personally, I would stay far away from it but that’s just because I don’t like clowns. I think I would almost rather be next to the shark car instead. Here is another car I would be afraid to get in. However, it doesn’t look near as scary as the clown car or shark car. My only fear is if I am next to it on the road if the top of the car might just fall off. Is it really safe to have a double car? Are those teeth coming out of the car on top? It would really make me look twice on the road if this pulled up next to me. I think that this car is perhaps the craziest but yet coolest of them all. 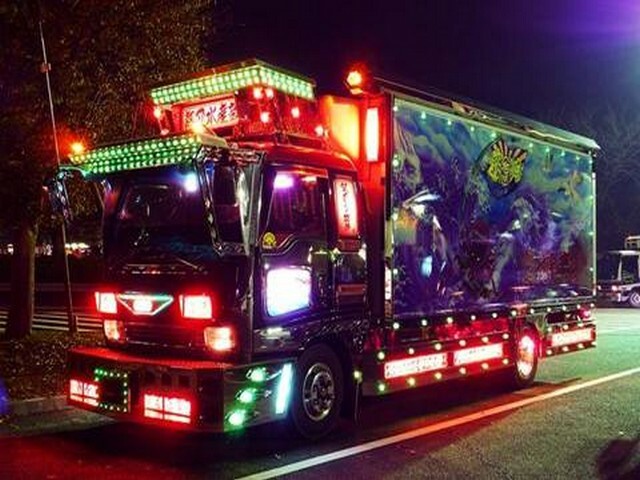 It is one that I would love to get in myself and would not be afraid if it pulled up next to me on the road. In fact, I would want to take pictures of it right away. It makes me want to start singing the ghost busters theme song “Who you gonna call?” Ghost busters! If you’re tired of riding in a boring car then come up with a brand new design and drive in a unique car design that belongs only to you.